"It's been a year since we began working with UpMenu and it has been a very good time for us. Orders have been increasing month-on-month, and the number of customers is still growing. We are happy with the high quality of the service. Such a system offers convenience for both us and our customers." "Felicita ', E' tenersi per mano, andare lontano, La felicita ..." - who doesn't know the famous song, whose very first words transport us to the pasta, wine and pizza capital of the world? Today we will tell you about an online food ordering system that operates in true Italian style. "Basiliana" was founded in 2014 by two friends. Since then, it has won the hearts not only of the residents of nearby towns, but also many Italians. The restaurant has created a diverse menu, designed to satisfy the needs of every customer. 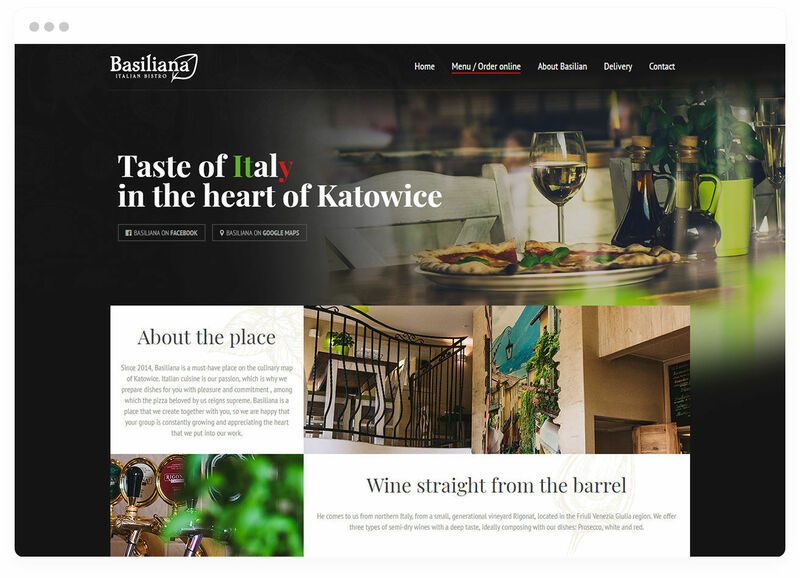 Basiliana’s restaurant website offers an UpMenu online food ordering system on their own restaurant website, and they can deliver to almost the entire city. What can you find on the Basiliana menu? There's a lot to choose from! From drinks to delicious food, the menu offers coffee, desserts, Italian pizzas, pastas, paninis and salads. "Basiliana" needed to increase its sales and profits. They decided to resolve this by launching their own online food ordering system and implement some restaurant marketing ideas as soon as possible. "Basiliana" launched its online orders in January 2018. From the very beginning, you could see noticeable improvements - month after month, the figures showed an impressive growth in orders. The restaurant has also obtained several new marketing tools, allowing them to automatically build up a database of customers who have consented to receive e-mail and text message campaigns directly from the admin panel in the UpMenu system. Launching the online food ordering system was the restaurant’s first step on the way to increase its profits, while the process of ordering food became much faster and simpler for the customers. "Basiliana" remembered to let their customers know about the new way for ordering food - the UpMenu system and the three different payment methods accepted: cash, card and online. The restaurant also offered a 10% discount on the first order placed via the website. The restaurant knows how important online activities are, but has not forgotten about offline marketing. On important occasions, such Basiliana’s 4th birthday, they prepare a special offer for their guests, which they advertise via social media. These activities have contributed to the impressive growth in online orders. During the past 12 months, these have increased by 44%. In January, 195 orders were placed online, while December of that year saw 346 being placed. It is clearly visible that from May to September the orders remained at a similar level. In the last three months of 2018, the number of orders clearly shot up. The restaurant has not rested on its laurels and is still promoting online ordering, offering discounts and promotions, communicated to its customers via various channels. The example of "Basiliana" shows that even a single venue can successfully increase its number of online orders. The use of the restaurants website for launching the online food ordering system and appropriate online and offline activities have had a significant impact on the sales. It is thus worth remembering that greater profits are also a result of consistency in promotional activity and of building loyalty among the guests. All this is supported by the functionalities of the UpMenu system. If you are interested in launching your own online orders, get in touch. Increase the number of your orders, just like "Basiliana" did!